-If you want a new awesome ringtone for your phone, and you have not been able to get it yet, Music Editor Free is here to solve that problem for you. Music Editor Free will not only help you to cut music so you can make ringtones for your cellphone, but it will also help you edit the audio file as much as you want, so your ringtones will be awesome, fun and unique. This post will teach you How to Cut Music to Make Ringtones for your cellphone. Why Cut Music to Make Ringtones? People often are in search of new ringtones for their phones. Sadly, the standard ringtones iPhones and Android cellphones have are simply boring and very stressing. Truthfully speaking, there is nothing as uncomfortable as receiving a notification with an old-fashioned ringtone who does not define who you are. 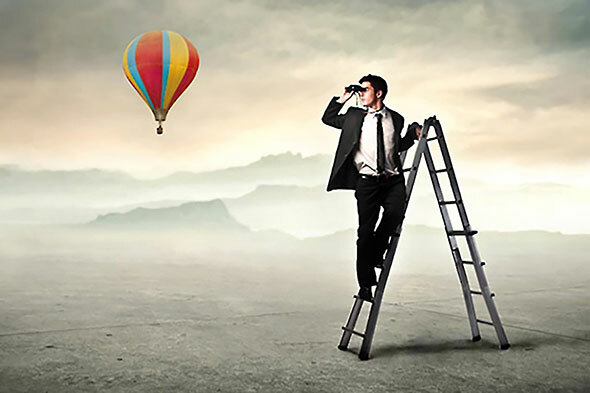 So, it is understandable why people look for a music editor which can help them create a new ringtone from their favorite song, or any other audio file they want to use. Experts from Softpedia realized this was happening and decided to create Music Editor Free, a software which is safe to use, and which can edit any wanted audio file. 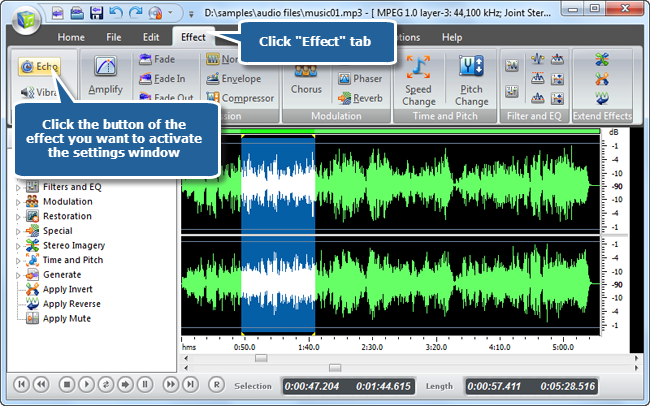 More and more positive reviews have been made to this software, which is considered “a full-fledged audio package”. Software like this one are a necessity and they are used not only by people who want to create ringtones, but also for music lovers who desire to create playlists to enjoy and for mixers who love to create different effects to audio files. This music editor offers tons of options on what to do with an audio file. You can cut, copy and paste any section of the audio file wherever you want to, and you can even mix audio files to create new astonishing sounds. 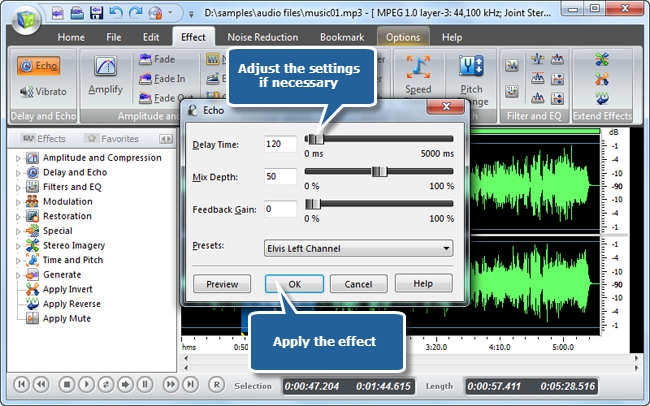 You can add different effects to create a unique file, such as amplifying, adding vibrations or reducing the noise to certain sections of a file. 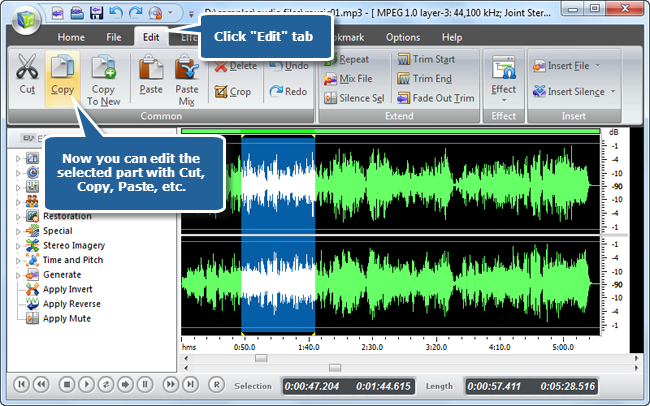 Music Editor Free lets its users play and personalize with an audio file with incredible precision. 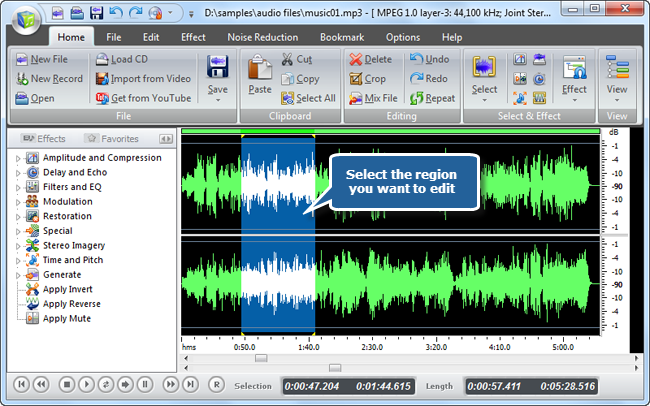 This is a music editor that does not only support MP3 format, but many others such as WMV, OGG, GSM, VOX, RAW and OPUS. This is great because not all music editors work with so many audio formats as this one does. It can record audios, no matter the source where they come (CD or tape players, electronic instruments, radio, vinyl records, and more) ; it can extract audios from YouTube or any video file; and it creates ringtones for your cellphone. There is nothing that this music editor cannot do. Downloading and launching this software is totally free and safe. You will not pay anything nor need to register in any website in order to have this music editor in your computer. Besides, downloading this software does not imply any damage for your computer since no malware, spyware or virus will be downloaded. How to cut music to make ringtones with Music Editor Free? Before you cut music to make ringtones, doing the easy 6-steps process, you must download Music Editor Free. Remember, downloading this software is free and does not imply paying any fee nor any type of registration. After downloading Music Editor Free, you must launch it. Step 1. Input an audio file. The first thing you need to do is input an audio file. You can do this by going to the upper tools bar and clicking “open”. Then, you have to select an audio file. 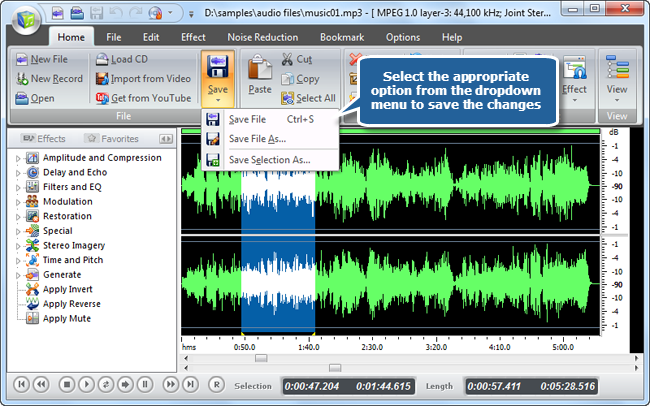 As previously said, this music editor does not only work perfectly with MP3 files, but also with many other formats. Finally, click “open” so the audio file you chose so you can input it. Step 2. Select a region. Before doing this, you must make sure where will the ringtone begin and where will it end. To select the region, click the part where the ringtone begins and carry the cursor until its end, without releasing the left mouse button. Step 3. Cut Music (Cut the selected region). Go to the toolbar and look for the option “Edit”. After clicking, a lot of editing options will be displayed, including “cut”. Click that function so you can keep only the selected section of audio you will use as a ringtone. Step 4. Add an effect to the audio if you want to. Click the “effect” option in the toolbar, so this music editor can display a lot of effects for you to use with your audio, such as “fade out”, “amplify”, “vibration”, “echo” and “fade in”. These options match perfectly for creating a unique and not old-fashioned ringtone that you will love to hear at any time of the day. Step 5. Set the output specifications. This music editor establishes certain standard parameters before the outputting of each audio file. But if you want to change them, you can totally adjust these settings as much as you want. Each ringtone can have its own output specifications. Step 6. Save the changes. After you apply the output audio settings, you need to go to the “Home” part at the toolbar. Click it so that new options can be displayed. Then click the “save” option so you can save the ringtone as a new file with a new name, in any desired location. You will now need only to copy this new ringtone to your cellphone and the process will be totally ready for your audio to be enjoyed and praised. That’s how to cut music to make ringtones for your cellphone. 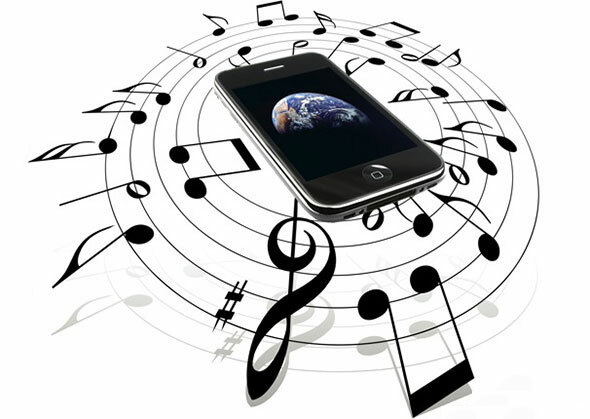 Creating a ringtone for your cellphone, whether it is an iPhone or Android, has never been so easy. 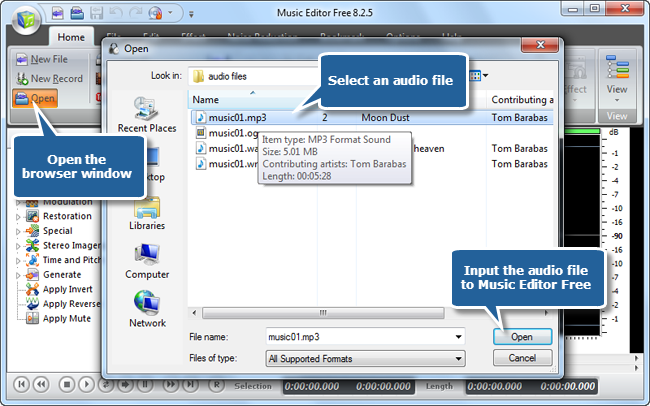 Music Editor Free is the best music editor and it will allow you to create ringtones from songs or any other audio files no matter the format. Your cellphone will be full of interesting and fun ringtones for every occasion. Undoubtedly, it is such a versatile software that we are more than sure it will remain in your computer to solve your problems at the time of recording audios and editing them.